Resplendent in an array of eye-wateringly bright costumes, including a traffic light and zebra crossing print combo, David Dale’s Claudia delivers one of best gags of the night. Pondering the clothing options for an evening out, the gruffly-voiced dame is wondering about her “Brexit dress” – “Everyone wants me out of it, but when I am, they’re not so sure”. Qdos Entertainment’s Cinderella hits a sweet balance between topical jokes, some dependable groaners, and a nice blend of variety, with a selection of impressive magical tricks – including a “vanishing” woman in a box routine – from the conjurer and comedian Martyn James, as Buttons. There’s pleasure, too, in Bernie Clifton’s take on Baron Hardup. Alongside the expected physical comedy – including a long-running struggle with a giant, and noisily deflating, inflatable, there’s also a surprise, for me at least, in the power of his singing voice, as demonstrated with a rendition of Love Changes Everything. There’s a lightness of touch to David McNeill’s production. It’s nimble and swiftly moving. Anita Dobson channels something of Cruella de Vil with her black dress and barbed comments – “being in Hull is like a fairytale, Grimm” – and something of the music hall in her winks to the audience. 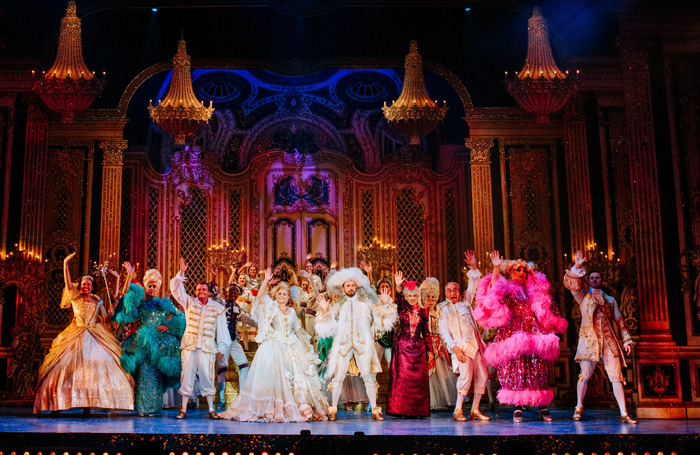 With some melodic original numbers, including one entitled By the Humber, and some well-choreographed classics, not least Dobson’s spirited take on Queen’s Don’t Stop Me Now, it’s a charming, traditional panto, with some spooky 3D effects, including a walk-through a haunted wood, throwing in some scream-worthy moments for the kids.